When it comes to reception stationery it’s always fun to see a new idea or design used by a bride. And it’s even better when there’s a tutorial given to show other brides how to create the same thing for their special day. There are a lot of DIY tutorials out there for a bride to use however sometimes it can be hard to weed through all of them in order to get the perfect project that works with your wedding. Below are a few DIY ideas for your table numbers. Follow the links given to find the full tutorial if there is an idea you’d love to try out! The best part about these ideas is that you don’t just have to use them for weddings. They can be re-purposed at your next party to label foods, hold place cards, etc. These holders are very easy and inexpensive to make. Lamp part accessories are used to create this look. The parts include a brass vase cap, shade clip, nuts and washers. Head on over to Card Girl for the original post and inspiration. Once you’ve picked up your lamp parts (You can check out your local lamp shop or Card Girl recommends The Lamp Shop online) and assembled them together spray paint the final product white, as shown, or any other color you love. Use this unique project to hold names, table numbers, or to identify buffet foods, etc. 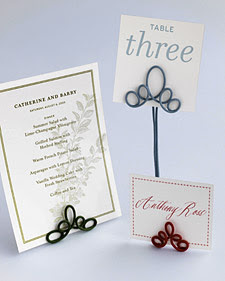 Pair them with any of our reception stationery ideas for a beautiful addition to your wedding decor. If you want a simple and customizable idea for your table number holders check out A Very Chocolate Life for a simple idea using spiral paper clips, modeling clay, tack glue and glitter. The best part about this design is the fact that you can mold the clay into any shape you’d like. As Melissa stated, you can roll out the clay and use your favorite cookie cutter to cut out shapes to go with the decor of you big day. 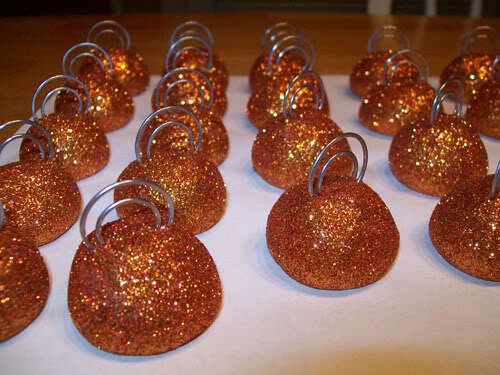 You can also paint the holders a certain color if glitter isn’t your thing. Or even get creative with the paper clip and bend a regular paper clip into shapes or use different shaped clips as well. And how could I do a DIY post without something from the fabulous Martha Stewart? 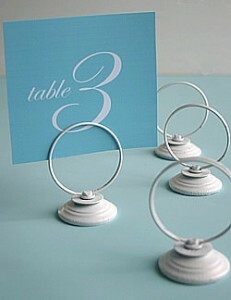 When I saw these wire table number holders I was smitten. Not only can you shape the wire into different figures and designs but it’s simple to! The sturdiness of the wire is also a plus. Not worrying about your table numbers getting knocked over or falling on their own is important. You simply grab some radio wire (solid, not stranded) and start creating. Martha gives a step by step tutorial to help you out. And if you have a design you love on your invitation, table number or place card you can try and replicate it in wire as well! Do you have a great DIY tutorial for reception or party stationery that you’d love to share with our readers? We’d love to feature you and your blog/website! Contact us at danielle@cherishpaperie.com with a link to your DIY project.